I became involved in Twickenham Riverside, a long-running saga about the fate of the old pool site, sometime in 2009. At this time very little was generally known about the site’s history and it was not until I started work on the Memories of Twickenham Riverside Heritage Lottery project that I discovered the grand neighbours who lived within sight of Strawberry Hill. Strawberry Hill is known as the home of Walpole, Pope and nearer to home, Abraham Prado, but just down the river an even grander house stood from 1662, Richmond House. The home to many of the rich and famous throughout the centuries, the impressive original house with its outstanding art collection was replaced by a more modest building during the early nineteenth century. This amazing history was explored by my good friends Sue and Jeremy Hamilton-Miller, in itself a tale of dedication and an enormous amount of primary research. The result is a book full of detailed historical information: Richmond House and its Inhabitants. The story starts with the Birkheads. Edward, the first inhabitant married Eleanor Myddleton. Members of the Birkhead and Middleton families emigrated to America and Henry Middleton was a signatory of the American Declaration of Independence. At the end of our project in June 2013 a certain Kate Middleton, the Duchess of Cambridge, was very pleased to receive a copy of “Richmond House” with information about her links to Twickenham. Richmond House also has connections to nearby Strawberry Hill House and it is documented that the descendants of Edward Birkhead, the owner of Richmond House, sold various plots of land to Horace Walpole. Of course, the original property at “Strawberry Hill” known as Chopped-Straw Hall had been bought by the retired coachman of Francis Newport, the Earl of Bradford, who purchased Richmond House in 1682. 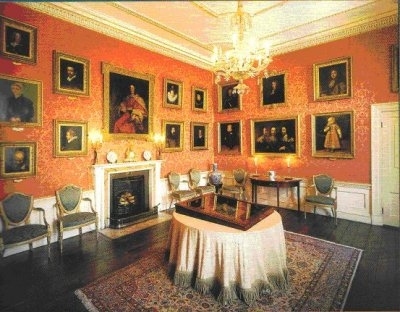 A very large art collection belonging to the Newports was later transported to Weston Park, a small part of which can be seen in the above photograph of Weston Park's dining room. Throughout the centuries the list of illustrious inhabitants continued with lords, ladies, earls and viscounts, until we come to 1923 and Joseph Theophilus Mears, a founder of the Chelsea Football Club, bought the house. Mears also owned a large fleet of passenger launches on the Thames, cinemas and a coach company. The rest of the story, as we say, is history. Mears bought the Richmond House site for £10,100 and sold it to the Council for £11,350 a year later. Richmond House was demolished in 1927 and the land along King Street sold to a property developer. A petition by residents resulted in a public bath house and outdoor swimming pool on the site, opened in 1935 in time for George V’s Silver Jubilee. After the pool’s sudden and unexpected closure in 1980 proposals for developments have come and gone with local elections in 2010 and 2018 hugely affected by this issue. It remains to be seen whether the site of Richmond House will see the return of an outdoor pool or whether relatively mundane housing will be the fate of this land which had such a grand history. In 2011 Berkley Driscoll and I brought back activities to Twickenham Riverside - overlooked by the Richmond House site. Residents will remember the river races, the fairground attractions and the music festivals. Our lasting legacy is the first Stand Up Paddleboarding club on the Thames and the Heritage Lottery projects recording the history of Twickenham: Memories of Twickenham Riverside, Lidos Alive and further along the river towards Richmond, the Most Famous Ice Rink in the World. Local Area, Prado's Grapes, Gifford Lodge, Pope's Legacy, Walpole's Strawberry Hill House.